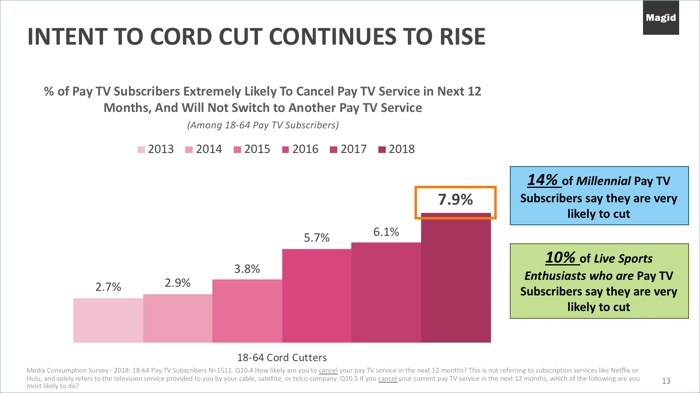 Magid released highlights from its new Media Consumption Survey 2018 at VidCon last week, including unsurprisingly, that cord-cutting intent is continuing to rise, especially among millennials. 7.9% of pay-TV subscribers age 18-64 years-old said they were “extremely likely” to cancel their service in the next 12 months, up from 6.1% in 2017. But 14% of millennials said they plan to do so. Even 10% of live sports enthusiasts said they are “very likely” to cut the cord. Interestingly though, “It’s too expensive” was only the 3rd-most cited reason for potential cord-cutters (cited by 25%), trailing “I don’t watch enough TV to make it worth it” (29%) and “I can watch the TV shows and movies I like on the Internet,” “I am satisfied with what I can receive over-the-air and “I am satisfied with online streaming options on my TV from services like Netflix and Hulu” (all at 27%). 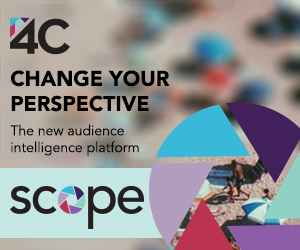 Back in 2014, cost was cited by 40% and has steadily fallen since then, with the OTT reasons rising in importance. Skinny bundles may be glimmer of light here, with 55% of consumers saying they’re interested in subscribing to a skinny bundle (up from 44% in 2017) and 35% saying they’re very interested. Millennials show above average interest, with 60% very interested. Despite the higher cord-cutting inclination, Magid found that 76% of U.S. households continue to subscribe to pay-TV, the same as in 2017. In fact, millennials actually ticked up from 72% to 73% adoption. Meanwhile, Magid found that 65% of 18-34 year-olds now watch online video at least once per day (49% for overall 18-64). 26% of millennials cited laptop/PC as their primary medium for entertainment (vs. 24% for TV and 22% for smartphones). Overall Netflix continues to be the SVOD market leader, with 58% of 18-64 year-olds subscribing, followed by Amazon (35%), Hulu (24%) and HBO Now (12%).